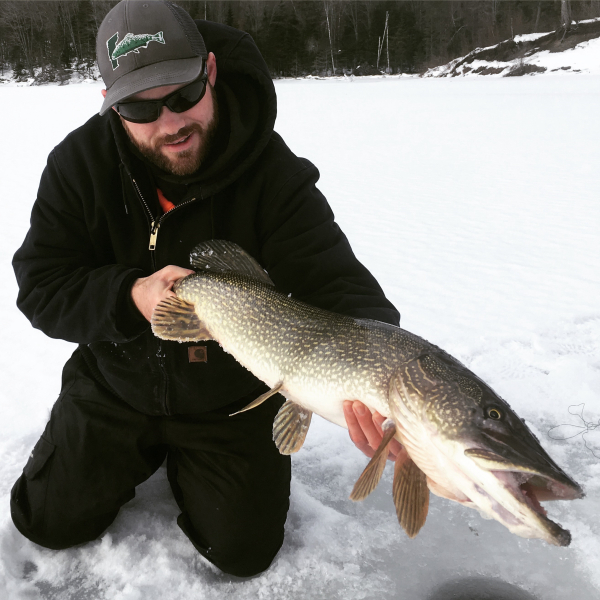 Northern pike are popular with ice anglers and are regularly caught in places like Missisquoi Bay, Dillenbeck Bay, Carry Bay, and Keeler Bay on Lake Champlain in addition to Lake Hortonia, Lake Bomoseen, Glen Lake, Marshfield Reservoir and the South Bay of Lake Memphremagog. Northern pike are often caught using live bait on tip-ups and are usually found in shallow, weedy waters. Landlocked Atlantic salmon can be caught in the Inland Sea area of Lake Champlain, as well as on Lake Memphremagog and Lake Dunmore. Several of the Northeast Kingdom’s deep-cold lakes support wild (naturally reproducing) lake trout. Salmon and trout can both be caught using tip-ups and by jigging lures. Walleyes can be targeted on Lake Carmi, Chittenden Reservoir and Lake Champlain. Walleyes spend most of their life in bottom waters so be sure to set your gear deep. Yellow perch, a close relative to the walleye, are widely distributed throughout the state and, like the walleye, provide a white, flakey, and delicious meat for anglers who plan to harvest their catch. Like other panfish such as bluegill, pumpkinseed and crappie, perch are most successfully targeted by jigging small lures tipped with a piece of worm or grubs. Rainbow smelt fishing can also be very productive this time of year as they are feeding heavily before spawning. Popular smelt waters include Lake Bomoseen, Lake Dunmore, Waterbury Reservoir, Joes Pond, and Peacham Pond. These waters are also stocked with brown trout which may be enticed to bite by using harvested smelt as bait. Vermont’s ice fishing season for trout, salmon and bass began on January 19 and continues through March 15 on 41 of Vermont’s larger inland lakes. For a list of those lakes, go to page 36 of the “2019 Vermont Fishing Guide and Regulations” available where licenses are sold and digitally on Fish & Wildlife’s website (www.vtfishandwildlife.com). To locate places to stay and get help on the latest fishing activity, go to the Vermont Outdoor Guides Association website (www.voga.org). Northern pike are often caught using live bait on tip-ups and are usually found in shallow, weedy waters.